Freegun jongens boxershort 'Shark duo' NIEUWSTE TREND! Freegun jongens boxershort 'Tiki duo' NIEUWSTE TREND! Freegun jongens boxershort 'Shark' oranje NIEUWSTE TREND! Freegun jongens boxershort 'Lego' NIEUWSTE TREND! Freegun jongens boxershort 'Icehockey' NIEUWSTE TREND! 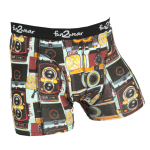 Freegun jongens boxershort 'Controller' NIEUWSTE TREND!